It takes a mediocre movie like Before I Fall to illustrate how brilliant Harold Ramis’ Groundhog Day is. Founded on the same premise, the movies show the variances that can result from different approaches. Groundhog Day uses comedy and wit to buffer its existential angst and cosmic sense of karma. 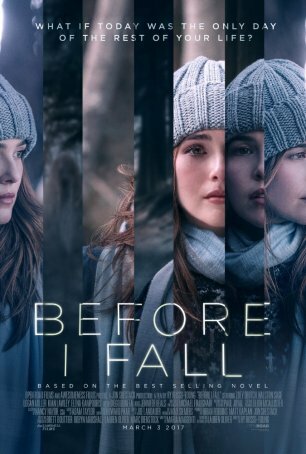 Before I Fall, on the other hand, adopts an oh-so-serious tone and resorts to awkward melodrama to get the point across. It’s Valentine’s Day and high school senior Samantha Kingston (Zoey Deutch) is doomed to live it repeatedly until she does whatever it is that Fate has decreed she must do to move on. It begins with her waking up to a song on her iPhone (not, by the way, “I’ve Got You, Babe” – the movie doesn’t have that sort of referential sense of humor) and ends with her dying in a car accident. Except, instead of waking up at the Pearly Gates, she returns to the beginning of the day with her memories intact. Those who don’t learn from history are doomed to repeat it. After acclimating, Sam varies things a little - dumping her three Queen Bee friends (Halston Sage, Medalion Rahimi, Cynthy Wu), trying to hook up with a “nicer” boy, etc. She eventually figures out that getting out of the loop involves doing something related to outcast Juliet Sykes (Elena Kampouris), but what? The kind of repetition necessary to Before I Fall’s narrative is not only inherently non-cinematic but potentially deadly to the movie. Who wants to see the same scene presented over and over again with only small variations? And, although it’s unfair to compare Bill Murray to Zoey Deutch, a case can be made that Murray’s performance keeps Groundhog Day from slipping into the rut that derails Before I Fall. For her part, although Deutch (most recently seen as Bryan Cranston’s daughter/James Franco’s lover in Why Him?) is appealing, she’s too old for the part. Halston Sage (in the “best friend” role), who’s actually a year older than Deutch, seems more age-appropriate for a high school student. Both are viewed as “up and coming” actresses and will likely appear in more impressive projects than this one in the near future. The saccharine message of “savor every moment” is driven home with sledgehammer-like subtlety. Director Ry Russo-Young’s unwillingness to give the audience even a scintilla of credit (a sentiment I can fully understand) results in not only a voiceover that emphasizes the moral but a final act that embodies it. Somehow, Groundhog Day is able to convey something similar without it becoming obvious or intrusive. Is it fair to catalog all the times when the Ramis film does things better than this one? Possibly not, considering that Before I Fall has been fine-tuned for viewers who have probably never heard of Groundhog Day, much less seen it. This movie is intended for girls between the ages of 10 and 16 and anyone outside that demographic is likely to have issues with parts of the script (or, in my case, pretty much the entire thing). To be fair, there are occasional moments that succeed dramatically. These are typically the quieter, less histrionic ones. I appreciated the scenes between Sam and Kent (Logan Miller), the prototypical “nice guy” trapped in the friendzone. There’s also something elegant about the way the movie ends. Overall, however, the lack of a compelling narrative thrust and inability to maintain an internal consistency about how the time loop works condemn this film to a fall from which it can’t recover.